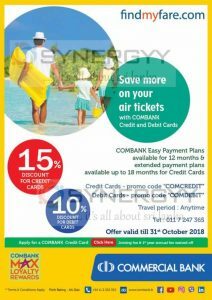 Findmyfare.com offer you a 15% off for your to commercial bank credit card and 10% off for your debit card on every purchases you made on www.findmyfare.com on or before 31st October 2018. And you will get an opportunity to convert the payment by 12 months easy payment plan via commercial bank and extend up to 18 months with nominal interest. Commercial Bank brought you a special promotion of 30% off for upto Rs. 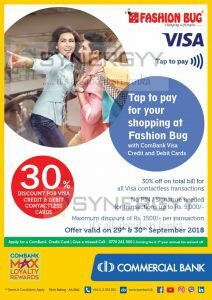 5,000/- transaction with Commercial Bank Visa Card Credit and Debit contact less cards on 29th and 30th September 2018. 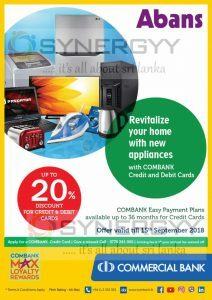 Purchase your home appliances from Abans with commercial bank credit or debit card and get a special discount upto 20%. And get an easy payment options upto 36 month for credit card and this offer valid till 15th September 2018. If you don’t have a COMBANK Credit Card, give a missed Call to 0770 241 000 and get credit card with free Joining fee & 1st year annual fee. 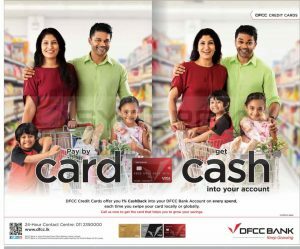 DFCC Bank announces special 1% Cash bank promotion for DFCC Credit Cards. The promotion works as CashBack into your DFCC Bank Account on every spend, each time you swipe your card locally or globally. Follow the simple steps given below and enjoy cash rebates on your monthly dining spend up to 50%. Spend anywhere with your HSBC Credit Card within one month to be eligible. Dine anywhere between 12pm to 2pm on weekdays from 1 May – 30 June. Enjoy a 50% dining rebate up to a maximum of Rs. 1,500 daily. 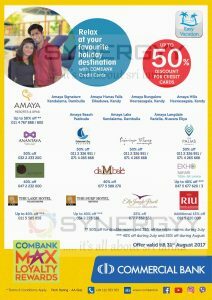 DFCC introduce the DFCC Premier Visa Infinite Credit Card, Sri Lanka’s first ever vertical credit card now offers you 1% CashBack* into your DFCC Bank Account on every spend, each time you swipe your card locally or globally. 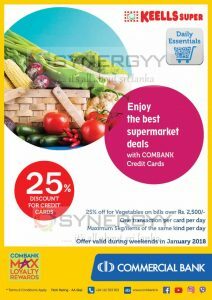 Commercial Bank announces a special promotion of discount upto 25% for Commercial Bank Credit cards on vegetable bill over Rs. 2,500/-. 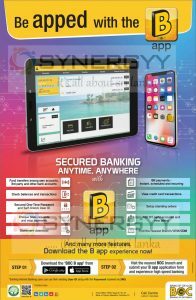 Bank of Ceylon introducing the new mobile app call Bapp for the bank account holders to enjoy multiple features as below stated, This is free application could be download from Google Play store or Apple App Store. Win more with your Seylan debit card and get 50% cash back! Spend a minimum of Rs.10.000/- with your Seylan Debit Card and be one of the lucky 300 to win a whopping 50% cash back on your monthly spend during the campaign period. The maximum applicable cash back will be Rs 5,000/-. 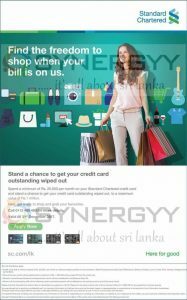 Standard Chartered Bank announces a special promotion for standard chartered credit card holders to wiped out value up to Rs. 1 Million until 31st December 2017. Spend a minimum of Rs.25,000/- per month on your standard chartered credit card and stand a chance to get your credit card outstanding wiped out, to a maximum value of Rs. 1 Million. Now, get ready to shop and grab your favorites and enjoy special wiped out. 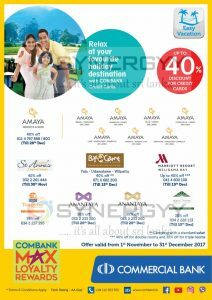 Commercial bank announces a special discount upto 40% for commercial bank credit card holders from 1st November to 31st December on below hotels. Enjoy hot discounts and cool advantages this festive season with your BOC Credit or Debit Card. BOC offers a fantastic range of discounts for leisure, pleasure, fashion, passion, to savour food or fitness as you wish this holiday season. Open a BOC Credit Card without a joining fee before December 31 and get hot seasonal discounts! for more details see below image or contact to BOC Call Centre on 0112 20 44 44 or visit Head Office, “BOC Square”, No. 01, Bank of Ceylon Mawatha, Colombo 01. 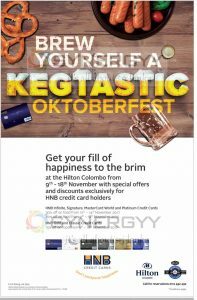 HNB Credit card brought a special discount up to 30% on Oktoberfest at Hilton Colombo from 9th to 18th November 2017. 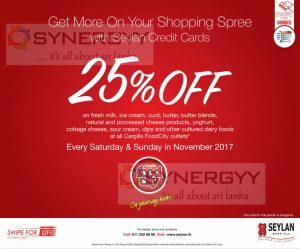 Cargills Food City and Seylan Bank brought you a special promotion on every Saturday & Sunday in November 2017 to enjoy your shopping at Cargills food city with 25 % off on your total bill. 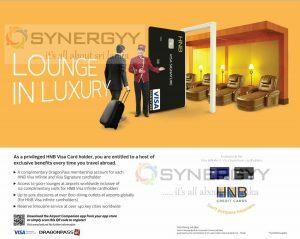 As a privileged HNB Visa Card holder, you are entitled to a host of exclusive benefits every time you travel abroad. Download the Airport Companion app from your app store or simply scan this QR code in below image to register! 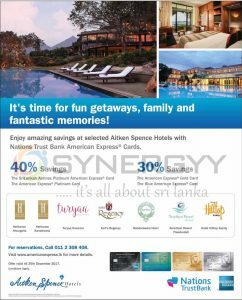 Nations Trust Bank and Aitken Spence announces a special promotion of discount upto 40% American Express credit card. Offer valid till 20th December 2017. Offers available at HeritanceAhungalla, Heritance Kandalama, Turyaa Kalutara, Earl’s Regency, Bandarawela Hotel, Amethyst Resort Passikudah and Hotel Hilltop Kandy. 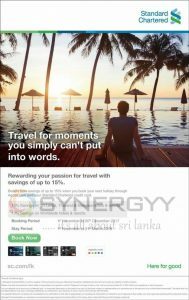 Standard Chartered Bank announces a special discount of 15% on agoda.com for standard chartered credit card for your travel between 1st November 2017 to 31st March 2018. Pump fuel worth Rs. 2,500 or more at any fuel station islandwide with your Nations Trust Bank American Express Card and stand a chance to witness the Abu Dhabi Grand Prix with your companion. 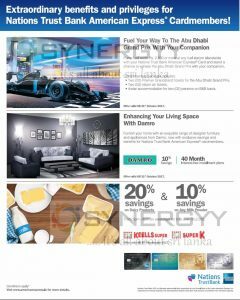 Two (02) Premier Grandstand tickets for the Abu Dhabi Grand Prix. Two (02) return air tickets. 4-star accommodation for two (02) persons on B&B basis. Offer valid till 31st October 2017. Furnish your home with an exquisite range of designer furniture and appliances from Damro, now with exclusive savings and benefits for Nations Trust Bank American Express card members. Are you into a holiday mood, here your HSBC Credit card brought you a special discount upto 30% from Anilana and Aditya until 30th November 2017. For more details see below image or Contact to Anilana or Aditya Hotel. it is good to note that the HSBC charge interest rate of 24% – 28% p.a for your credit card if you unable to pay it on time. therefore when ever you use the credit card, make sure you pay it on time, unless you will end up paying Interest payment and late penalty payment against your shopping. 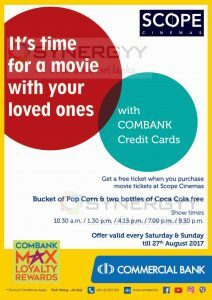 Commercial bank and Scope Cinemas brought you a special promotion, buy your scope cinema’s movie ticket by commercial bank credit card and get Free Pop Corn and Two Bottle of Coca Cola. The offer valid till 27th August 2017 and only on movies shows of 10.30 Am, 1.30 Pm, 4.15 Pm, 7.00 Pm and 9.30 Pm. 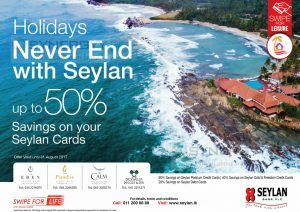 Seylan bank credit card announces a special promotion for their credit card holders to enjoy 50% off while their stay at The Eden Resort & Spa, The Paradise Resort & Spa, The Calm Resort & Spa and Dickwella Resort & Spa. 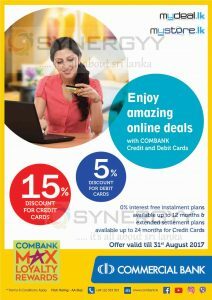 Commercial Bank and Mydeal.lk announces a special promotion for the commercial bank credit and debit card holders to enjoy a special discount on every purchase you made till 31st August 2017. And you got special 0% interest free instalment plans available up to 12 months and extended settlement plans available up to 24 months for credit cards. 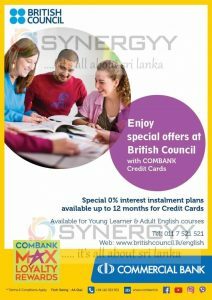 Commercial Bank and British Council announces a special promotion for Commercial Bank Credit Card holder for pay yours or your kids’ payment for British Council Young Learner & Adult English Courses and get special 0% interest installment plans available up to 12 months for credit cards. 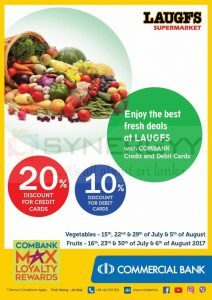 Commercial Bank and Laugfs Supermarket announces a special promotion for Vegetables and Fruits for commercial bank Credit and Debit card. 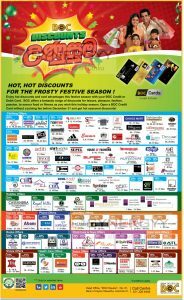 Enjoy 20% discount for credit cards and 10% discount for debit cards. 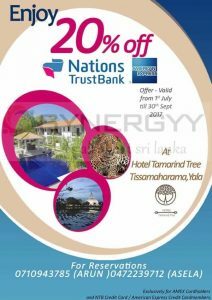 National Trust Bank and Hotel Tamarind Tree announces a special promotion for American Express Credit card holder and NTB Credit card holders to enjoy a Yala National Park Wildlife Tour and hotel stay at otel Tamarind Tree with 20% off from 1st July to 30th September 2017. The first Bank in Sri Lanka to introduce an internationally valid Chip b PIN Debit Card for a more secure shopping experience. The PIN will be sent to your registered mobile number via SMS at the time the branch issues the card to you. You need to change the PIN at a Commercial Bank ATM before you perform a POS transaction or ATM transaction. Just enter your PIN at the POS machine to authorise your transaction. How will you know if you have a chip & Pin card? 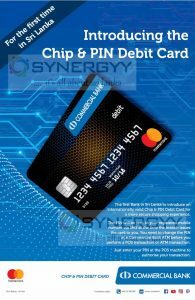 You may also swipe your card to pay if the merchant’s terminal is not yet chip enabled. Seylan Bank announces a Cracker deals for Seylan Bank credit card. Enjoy 60% off when you booking made through www.aitkenspencehotels.com/sey60 with the Promo Code of “SEY60”. After 60% off Heritance Ahungalla Price would be LKR. 12,200 per Room and Turyaa Kalutara would be LKR. 11,500/- per room.